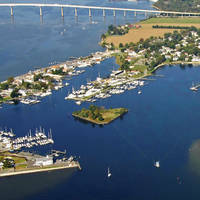 Cambridge Creek Inlet is located on the Choptank River about 16 miles east of the main Chesapeake Bay Channel. Passage up the Choptank River is easy and straightforward if you follow all the aids to navigation precisely. Those aids to navigation typically mark long-reaching shoals that extend north or south from the respective shorelines with two- to three-foot depths just outside the marked channel. 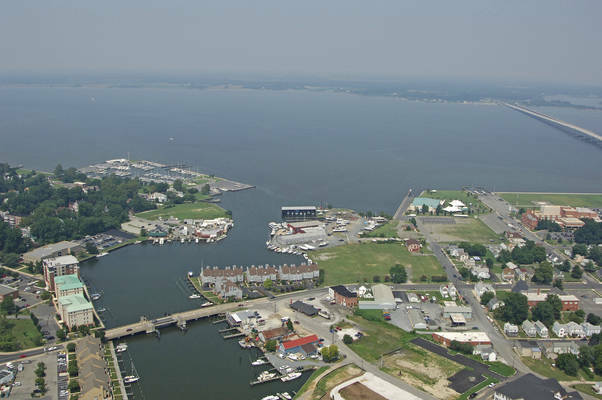 The image above is a view from the southwest looking northeast over the opening of Cambridge Creek at the Choptank River. Off to the right (east southeast) is the state Route 50 Bridge (50-foot fixed vertical clearance), which carries heavy volumes of traffic of people traveling to and from the beach resorts in Ocean City to the southeast. 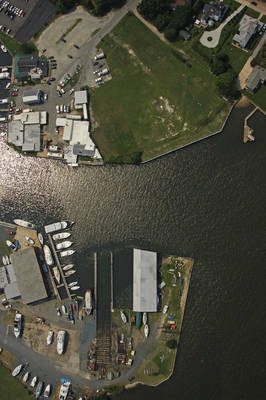 On the left (west) side of the inlet opening is the Cambridge Municipal Marina, while the expansive Yacht Maintenance facility can be seen on the right (east) side just across the creek. Farther in is the Maryland Avenue Bascule Bridge (eight-foot closed vertical clearance), which opens on a restricted schedule mornings, evenings and weekends. Use NOAA Chart 12266 and 12268. To reach Cambridge Creek from the Choptank River, first navigate to green nun buoy 23 north of Hambrooks Bar. Green nun buoy 23 is located near waypoint N38 36.033 W76 05.082. Once you have picked up green nun buoy 23, set an approximate course of 152 degrees magnetic to intercept red nun 24, which is about .8 mile away (mind the flashing white light at Hambrooks Bar along the way). From red nun buoy 24, you can start your turn south toward the Cambridge area. 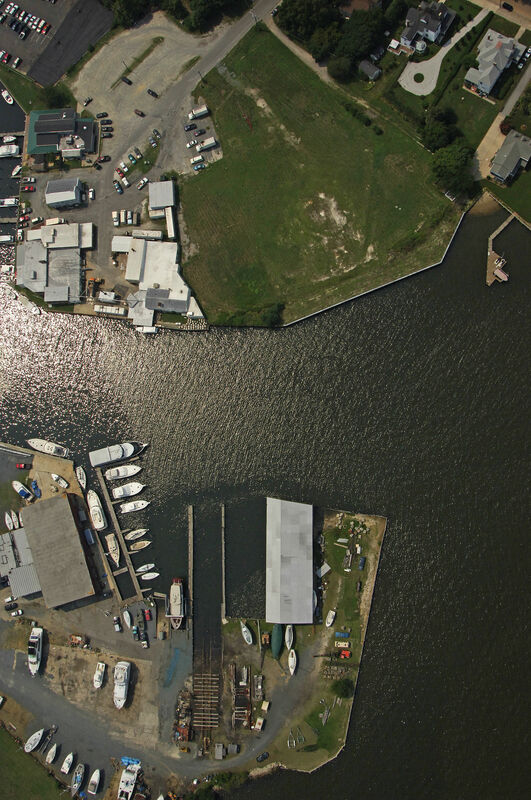 If you want to head to the Cambridge Municipal Marina, which is located outside of Cambridge Creek, set an approximate course of 173 degrees magnetic for about one mile. 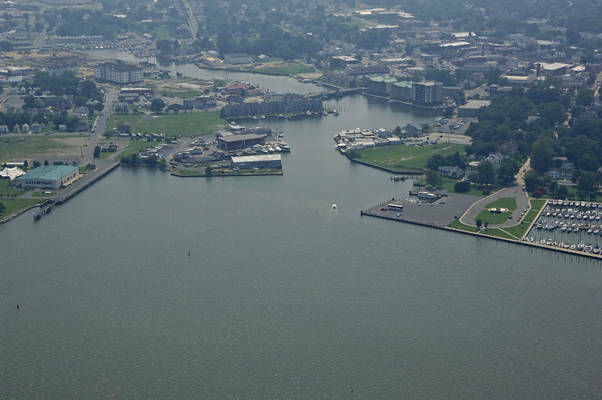 This course will put you just north of the municipal marina channel. Mind the two-foot-deep shoal to the west along the way - the aforementioned course should keep you well out of trouble, though. Alternatively, from red nun buoy 24, you can set an approximate course of 151 degrees magnetic for about a mile to pick up flashing green buoy 1 and red nun buoy 2 at the beginning of the Cambridge Creek approach channel. After you have cleared flashing green buoy 1 and red nun buoy 2, head southwest and follow in green nun buoy 3, red nun buoy 4, and finally red nun buoy 6 just outside the creek entrance. Keeping to the center as you head upstream from here will keep you in the deepest water (11-foot depths all the way upstream). 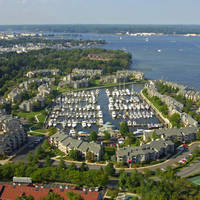 There are six marinas on Cambridge Creek, but only thee of them accept transient guests. 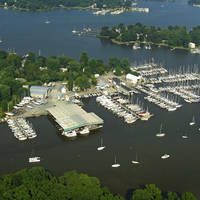 Many of the marinas here are set up to mainly handle repairs. If you want luxury accommodations, the Hyatt Regency just upriver from the state Route 50 Bridge has 150 transient slips in a resort-style atmosphere. No reviews yet! Be the first to write a review of Cambridge Creek Inlet.